Today is a special day for me, my blog baby’s 5th birthday. She is just shy of 6 months younger than my daughter. When I started the blog I never ever thought I will reach here. It started as a fun to share my hobby of cooking. As it is October 29th, blog is going to be everything for me on this day. 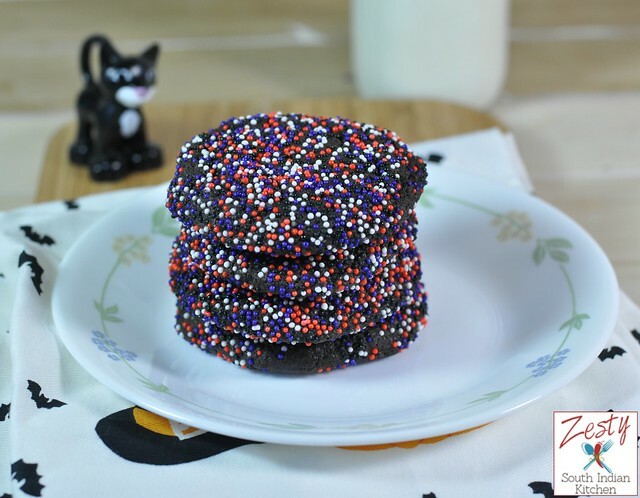 To celebrate blog’s birthday I made this Halloween sprinkle cookies so that I can combine both blog anniversary and Halloween. Thus my blog baby’s celebration got a sweet treat. Blogging taught me a lot, also made my life little crazy as struggling to take pictures or to get the recipe right, when my little ones are crying in the background for continuous attention. When I started I never got a comment for my initial posts. My first photographs were not good; still I am trying to improve as much as possible. I also made a few good friends along the way, and also got quite a few loyal readers who are the lifeline of this blog, without them I don’t think it won’t exist here. I always make sure that never to repeat any recipes in its entirety, and adjusting to suite my taste buds, and make it into a new recipe. I am not crazy of all the butter less, eggless, sugarless stuff. My belief is that egg gives wonders in baked goodies when none others can repeat. Do to my hubby’s diabetics, sweet dishes has gone a makeover of small to mini version. Still I make sweets as my little ones loves ice cream, cookies etc. Also when it comes to traditional recipe I never try to alter anything, these are traditional for a good reason. My hubby asks me do you think how many years you going blog. I told him I don’t know. If I were not blogging, I won’t learn lots of new recipes. Blogging introduced me to bread baking avenue which is my weakness. Still learning to make bread with both yeast and sourdough, rye breads are weakness in my house. Last week when I called my aunt and told her I made so and so for Diwali, her first question did you learn to make all those, my answer was yes. My relatives knew I won’t cook anything until my mom was there. Once I left the country and stayed alone, I started cooking. My hubby and kids are my main supporters, they criticize and evaluate the meticulously, my kids are ruthless taste testers; if it is not good they will spit it in front of you. From the bottom of heart, I thank all my readers and friends for without you Zesty South Indian Kitchen won’t a success. Please continue to shower your love in the coming years too. When I get feedback like the one below, it makes my day. 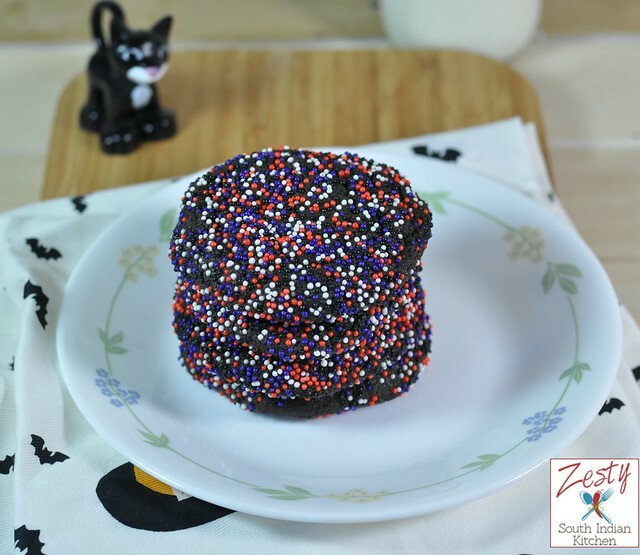 Coming to Halloween sprinkle cookies, it is an easy dark chocolate cookie with sprinkles; I used two kinds of sprinkles, and my daughter helped me make the cookies. She started helping from licking the bowl, to help in coating the cookies with sprinkles. It is an easy chocolate cookie with touch of cornstarch and dark cocoa. If you can’t get hold of dark cocoa try normal one. This is really easy to make and tastes great too. My daughter asked me to make one more time. Here comes the recipe give it tries. 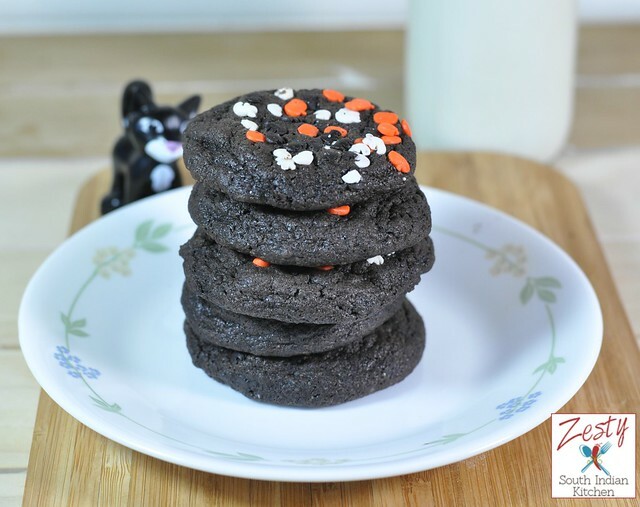 Delicious dark chocolate sprinkle cookies perfect for Halloween treat. Preheat oven to 350 F. Line one or two baking sheets with slipat or parchment paper. In the bowl of your KitchenAid with the paddle attachment, cream the butter, sugar and brown sugar on medium until light and fluffy for 1-2 minutes. With the mixer on low, add the dry ingredients a little at a time, beating until just combined. and place it on the prepared baking sheets, about 2 inches apart. Bake for about 8 minutes (rotating your cookie sheet(s) halfway) or until the edges of the cookies are set. The centers may look a bit underdone – but they will finish baking on the cookie sheet. Allow the cookies to cool for a few minutes on the cookie sheets. Remove the cookies from the sheets and allow to cool completely,on a wire rack. Copyright ©2014 Zesty South Indian Kitchen by Swathi(Ambujom Saraswathy) All Rights Reserved. Totally love it! I love the colors and the cookies.. I’m sure it tastes super delicious. I wish I could trick or treat near your place, these would be a great treat! Congrats on your 5 th anniversary swathi .I was thinking ur a malayalee as you had many wonderful sadya recipes in your site.Bread is another thing ur expert in ,But while starting i know how you felt .May be in coming years i will get expertize in bread baking too .Sprinkle cookies look wonderful too. Aww…happy 5th birthday, Zesty South! Congratulations and good job to her mum! Thanks for the Halloween Cookie treats! 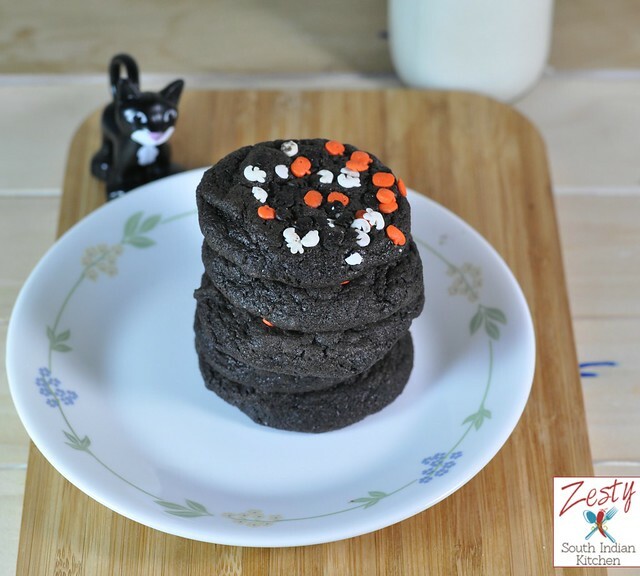 Congrats Swathi, and these Halloween cookies look great,an excellent way to celebrate the blog anniversary..
Love these cookies and they would not last long if I’m around! happy 5th anniversary Swathi. Lovely colourful cookies. Cookies looks colorful….. Happy Anniversary dear !